I used to have about 2 big plastic trays of toys in my living room. Of course there were more toys in my then only child’s (now I’ve 2) room. But generally I kept some in the living room so he could play there too. Well as parents you probably know that toys grow. Um hmm… almost as quickly as kids do! The room filled up and soon more trays were needed in the living room. 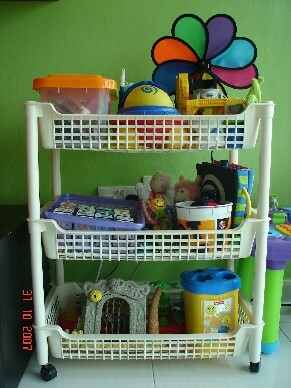 It created more mess and it was such a bother when we needed to clean the floor what with all the filled trays lying around.Then one day when I visited one of my “mommy” friends I noticed she had bought a new plastic 4 tier trolley and kept her kids’ toys neatly in her living room. It was brilliant. So I shopped around and bought one myself. It’s really neat. It takes up less floor space. It’s easy access to the toys for the kids. Best of all, it has wheels on them – yes! It’s mobile. You can push it around when cleaning the floor without having to bend too much. It can be be pushed to anywhere you want the kids to play (mine stays in the living room as there’s not much “other” places besides the kids’ room where they can play!). Every now and then I rotate the toys. You know, store some into the cupboards and bring out others. Keeps the children interested… well… at least it does sometimes! For more ideas visit Works For Me Wednesdays (WFMW). Great idea!! Even though we have a large play room there are still toys stored in the living room and den. Of course a play room isn’t as much fun when you are supposed to play in there. I love your idea! I don’t know if I have ever seen anything like that. Did you get it at a Wal-Mart/Target type store?? Just wondering! Thanks for the tip!! Oh dear, I’m not sure if I can help you. I live in Singapore but yes I bought mine in a Wal-Mart/Target type of store – a hypermart kinda store. Thanks for the tip – I like the idea of minimizing the number of toys to just those on the cart. Kids don’t play with all the toys when they are all out, weird. Great idea! We use square baskets in the bottom of our bookshelves as well, but they aren’t mobile and they take up book space. Thanks for sharing!